Distance from the Liberty Stadium: 184 miles ~ 3 hours 40 minutes. Away fans are in the corner between the East and South Stand. The stadium and facilities are superb; an amazing PA system and TV screens on the concourses. The Derby fans are noisy, and with the bowl design of the stadium making a great atmosphere. Available are pies, pasties, burgers and hot dogs. There’s also a betting outlet on the concourse. Derby is very central to most areas of the country and has a decent food and night life scene. It is a great place to stay, if you want to explore the nearby delights of the Peak District. 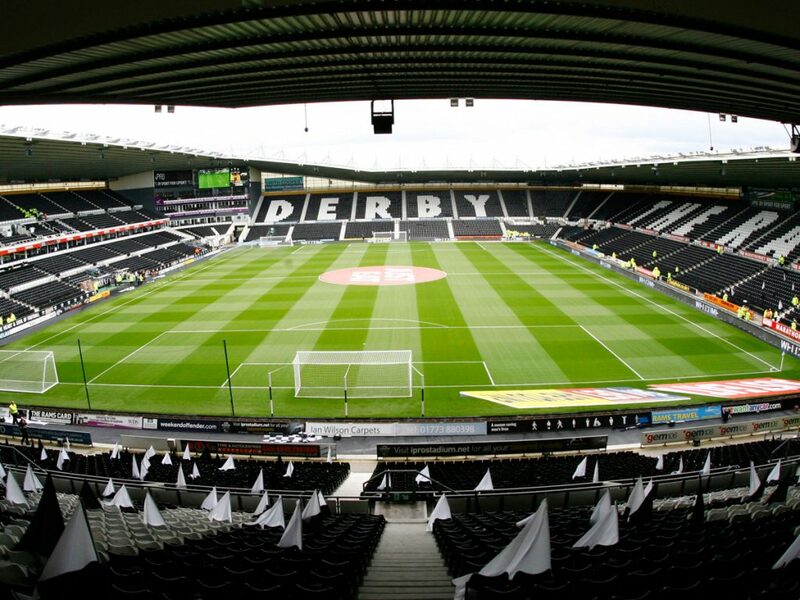 If you are planning to stay over, then there are several nearby hotels to stay at when visiting Pride Park. The Travelodge Derby Pride Park (DE24 8HG) is 0.2 miles away, Pentahotel Derby (DE24 8PU), 0.6 miles away. Near the Derby Midland train station are Aston Court Hotel, Hallmark Inn Derby (both DE1 2SL) and Hallmark Hotel Derby Midland (DE1 2SQ) all of which are approximately 1.5 miles away. Derby Theatre (DE1 2NF) has Hansel and Gretel with tickets £12.50-£28.50. The night before the game, The Sitcom Experience – Fawlty Towers Dinner Show is at the Makeney Hall Hotel (DE56 0RS), tickets are £41.50 and includes a 3-course meal and a night of comedy. Derby Roundhouse (DE24 8JE) has Moroccan Fire Nights from mid-November to the end of December. Cirque style aerial and ground entertainment such as tightrope walking, trapeze, flying hoop, contortion, fire and acro-balance during the evening. Tickets over the weekend of the game are £44-£63.50. Mount Cook Adventure Centre (DE4 4LS) has a decent deal. For £39 per person (over 20’s), you get a pub quiz on Saturday night, a Christmas jumper competition with prizes, turkey & stuffing baps, en-suite overnight accommodation, a cooked Sunday breakfast and 2 hours of activities including high ropes and an archery tag tournament. The centre is halfway between Derby and Sheffield. Denby Christmas Market (DE5 8NX) is just north of Derby and on during the weekend of the game. 30+ stalls sell seasonal gifts, handmade jewellery, textiles and artwork, home fragrances and accessories, chocolates. Food and drink is sol, parking and entry is free. A couple of pubs are near the train station, Merry Widows (DE1 2RU) and The Brunswick (DE1 2RU); both welcome away fans and are 1.2 miles away or ‘Alexandra Hotel’ (DE1 2QE), 1.1 miles away. The Navigation Inn (DE24 8UU) is 0.7 miles away and has a basic food menu and serves decent beers. There’s a Harvester, The Pride Park (DE24 8JE) 5 minutes (0.6 miles) walk from the stadium, but doesn’t always admit away fans. Frankie & Benny’s and Subway are across the road from the club shop and close by are Burger King, KFC, McDonalds and Pizza Hutm for those that like fast food. There are car parks at the Velodrome next to Pride Park close to the away fans entrance. Cost is £8 per car, or £6 if the car has four or more inside. There’s parking for £5 at the Derby Conference Centre on the A6 London Road, (DE24 8UX). Park up, buy a ticket at reception and show it in your car. It’s near the Navigation Inn (DE24 8UU) and then a 10-15 minute walk to the turnstiles. A few businesses off the main A52 near to the stadium offering parking for £6. On the Meadows Industrial Estate, Bamfords Auction House (DE21 6EN) has parking for £5. For those that arrive early, there’s street parking on Downing Road on the West Meadow Industrial Estate (DE21 6HA), off the A52. It’s then a 10-15 minute walk to the stadium. You can also choose from a selection of private car parking spaces near Pride Park – including on-street parking, off-street car parks and around 32 reservable parking spaces from just £3.00 per day. The ground is a 10 minute (0.8 mile) walk from Derby train station. Trains leave Swansea at 07:29, 08:29 and 09:33 for the 4 hour journey. Trains back are at 17:37, 18:37 and 19:39 getting in at 21:43, 22:44 and 00:03 respectively.